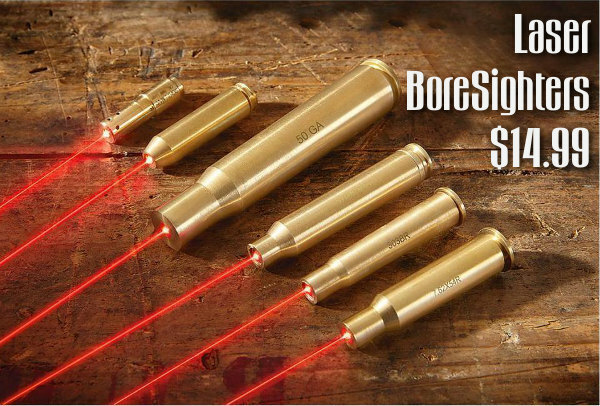 With good factory rifle ammo costing $1.00 per round — a Laser BoreSighter could pay for itself in just a couple range sessions. 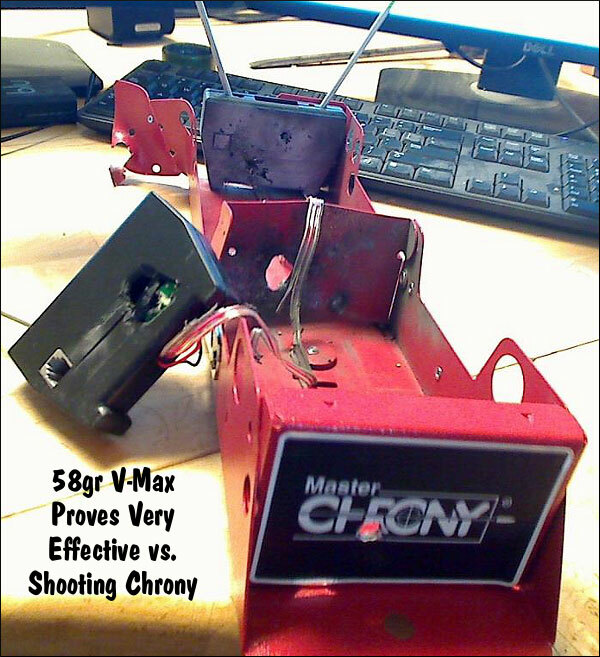 Laser BoreSighters — fitted to your chamber — help you get on target more quickly, particularly with factory firearms. Just activate the unit, slip it into the chamber and look for the red dot on the target. 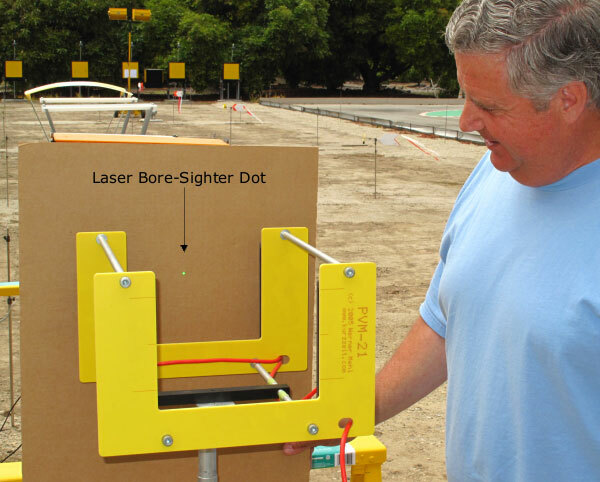 The laser dot is about 2″ in diameter at 100 yards, and is visible even in full sunlight. Right now you can get HQ Issue BoreSighters for just $14.99 at Sportsman’s Guide (member price is $13.49). These units have a durable brass metal body and the battery will run an hour. Boresighters are offered for numerous popular rifle cartridge types including: .223 Rem, .22-250, 6.5 Creedmoor, .308 Win family, and .30-06 (full list below). Sportsman’s Guide also offers Pistol Laser BoreSighters for $17.99 (pistol chamberings: .38 SPL/.357 Mag, .40 SW, .44 Magnum, .45 ACP). In-chamber BoreSighters are much safer than the kind that you insert in the end of the barrel (or attach to muzzle). If you forget your laser bore-sight placed in the end of the barrel, and then fire a round, you can blow up your barrel and/or suffer serious injury — it HAS happened,. Share the post "Bright Bargain: Laser BoreSighters Under $15.00"
Do you think your borescope is a state-of-the-art bore inspection device? Well think again. There is now something way more advanced than any optical borescope. A new laser-equipped scanning device can map the entire interior surface of a barrel bore. With this new technology you can now examine every land and every groove, millimeter by millimeter, from the chamber to the tip of the muzzle. The most minute flaw in a barrel can now be revealed. Until the 1980s, gun tube inspection had to be conducted by hand using a manual “star” gauge, a process that would take hours and provide minimal data. Electronic gauges were eventually developed along with the video bore scope, but these systems were still limited to very few, low-resolution data points. That has all changed with the BEMIS™, a huge leap forward in technology that is capable of rapidly capturing thousands of precise data points. Chesapeake Testing commenced BEMIS-SC barrel inspection services in September 2014. Testing is performed in Chesapeake’s commercial barrel inspection laboratory, located in Belcamp, MD, minutes from the U.S. Army Aberdeen Proving Ground. While testing is currently limited to .22 to .50 caliber barrels, Chesapeake Testing will accommodate both smaller and larger calibers in the future. “We have always focused on building our company around very unique technologies. 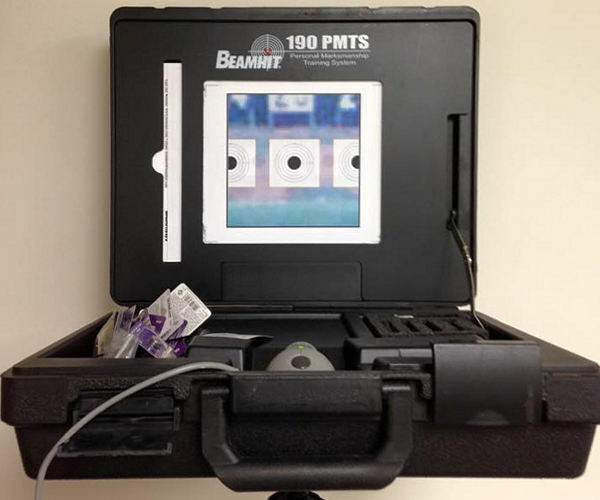 BEMIS™ has changed the industry in regards to the inspection of weapon systems. 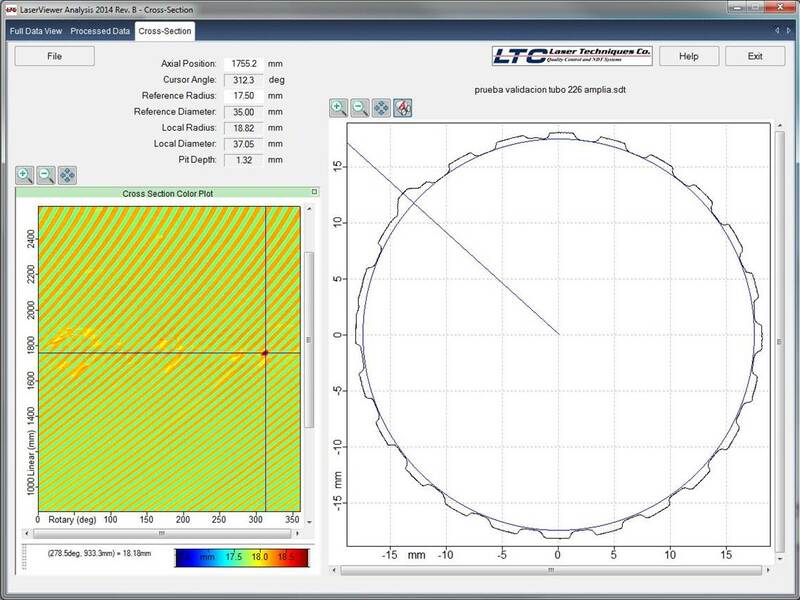 We are excited to be an exclusive partner with LTC in this industry and look forward to contributing to the future of this technology,” says Jim Foulk, founder and president of Chesapeake Testing. 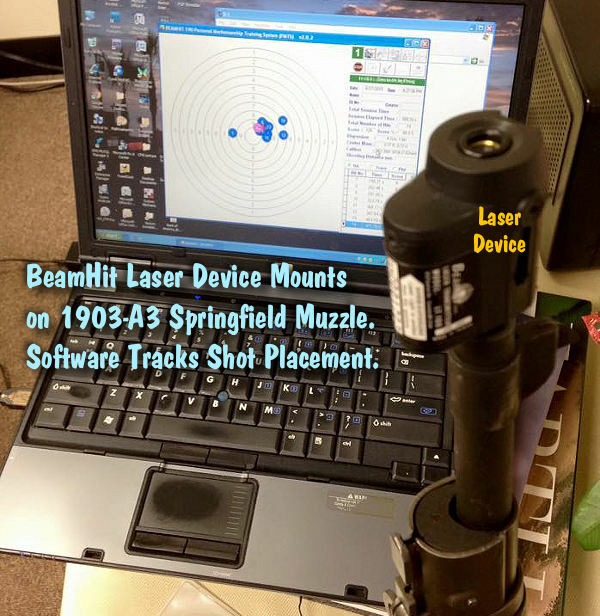 Share the post "Beyond the Bore-Scope — BEMIS Laser Bore Inspection Machine"
Do you own a .22 LR rimfire pistol? 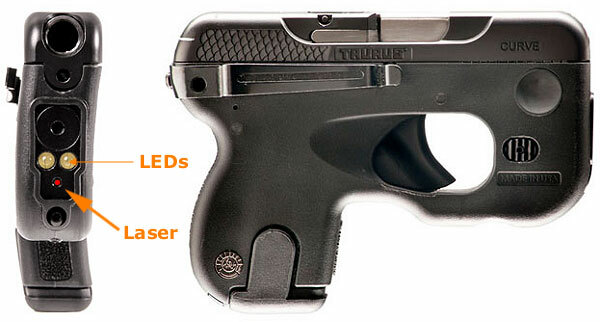 Well now you can transform that handgun into a high-tech laser pistol, thanks to a new gadget from LaserLyte. 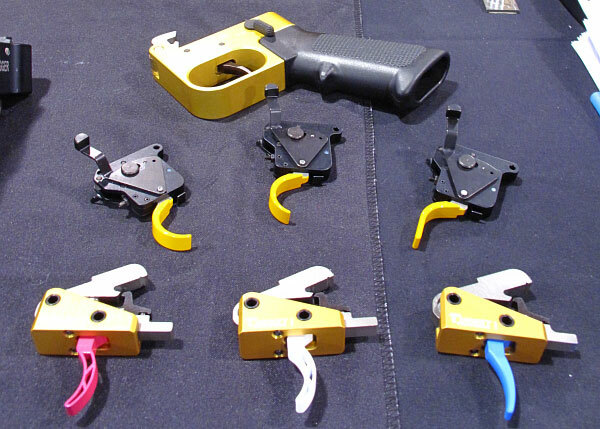 The new .22 Caliber Laser Trainer works with nearly all .22 LR pistols (but not revolvers) with a striker or conventional firing pin. 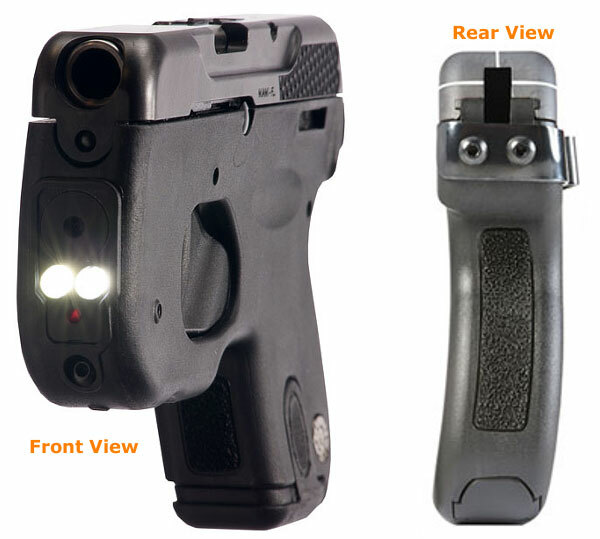 The battery-powered device emits a laser beam when you pull the trigger. The video below shows how it works. We have to admit we liked the idea of this device so much, we ordered one from Amazon.com. The $83.22 retail price seems a little steep, but think of all the money you can save on .22 LR ammo (which is pretty darn hard to find these days anyway). We just wish there was a version for .22 LR revolvers. Share the post "Can’t Find .22 LR Ammo? Here’s One Solution…"
Snow on the ground? Can’t go shooting outside? Here’s one way to have fun indoors while practicing your aiming skills. 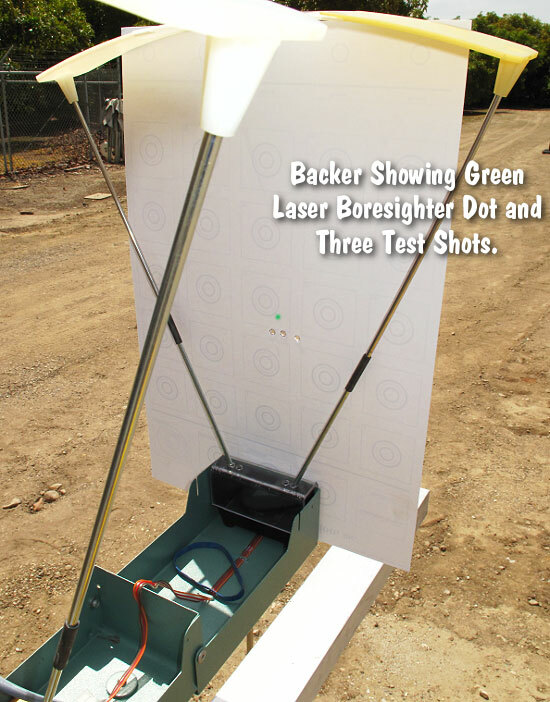 LaserLyte offers a set of three cans equipped with laser-activated “kickers” on the base. When a laser hits the can in the right spot the can topples over. 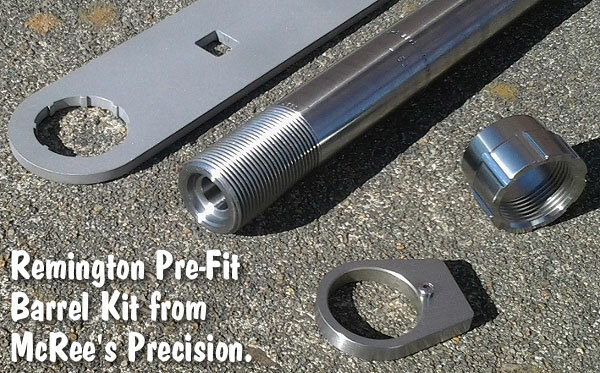 The laser activates a solenoid that releases a spring-loaded plunger. To reset the cans, simply stand them up and depress the plunger. 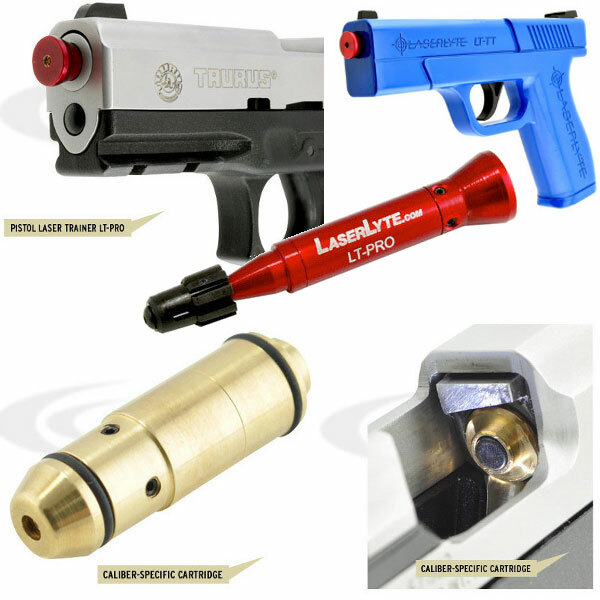 The LaserLyte® Laser Plinking Can Set is sold in a three-pack with three 9V batteries included. 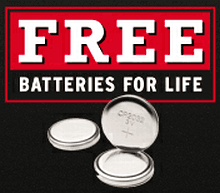 One battery will tip the can over about 8,000 times. Watch the video to see how it works. This would be fun with kids (just follow safe practices with the laser beams). To direct a laser at the plinking cans, you’ll need a firearm fitted with an in-barrel laser (instead of live ammo). 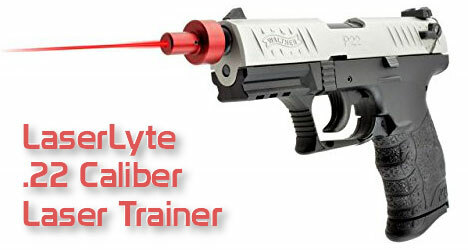 Or, alternatively, you can use the blue plastic LaserLyte training pistol ($54.95). For actual handguns, you can use the universal LT-Pro laser module, or a caliber-specific unit that fits the chamber of your gun. The blue training pistol is designed to work with the LT-Pro universal module, as you can see in the video below, a field test by Gunsandammo.com. 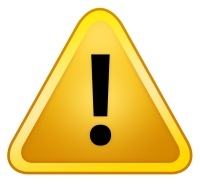 The testers noted that the cans may be sensitive to very bright light sources. Share the post "LaserLyte Plinking Cans Jump When Hit By Laser Beams"
Could your next metal scope rings, trigger guard, or muzzle brake be crafted with a 3D printing process? It’s possible. 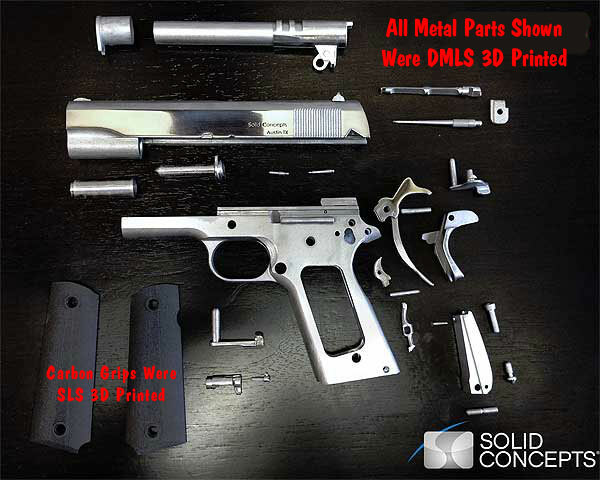 In fact, a wide variety of metal parts (even a complete handgun) can be printed using the latest 3D Direct Metal Laser Sintering (DMLS) process. The way this works is as follows: powdered metal is heated by a laser, causing the metal particles to fuse and solidify. This is progressively repeated, in vertically-stacked layers, until the entire metal part is complete. It’s like building a metal layer cake with the shape/size of each thin layer defined by a precise laser beam. The laser is guided by computer-controlled servos following a CAD “blueprint”. This video demonstrates how metal parts are 3D printed using the DMLS process. This technology is offered by Solid Concepts, a leading rapid prototyping and manufacturing services company. Solid Concepts has manufactured the world’s first 3D-printed metal gun using a laser sintering process and powdered metals. 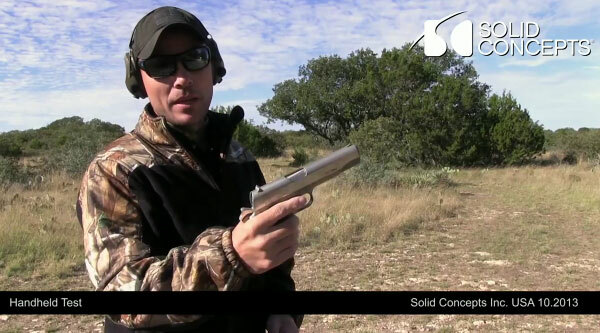 The gun, a .45 acp 1911 clone, has already handled 50 rounds of successful live-fire testing. A 1911 design was chosen because the “blueprint” is public domain. The gun is composed of thirty-three, 17-4 Stainless Steel and Inconel 625 components, crafted through the DMLS process. Even the carbon fiber-filled hand grips are 3D printed, using a Selective Laser Sintered (SLS) process. Will we see complete 3D-printed metal guns on the market soon? That’s unlikely. It’s still more economical to produce complete guns the old-fashioned way. However, we may see 3D printing used for rapid prototyping. In addition, 3D metal printing has advantages for hard-to-machine parts with complex geometries. Solid Concepts reports that its 3D printed metal has fewer porosity issues than an investment cast part and better complexities than a machined part. It will be interesting to see what unfolds in the years ahead. Share the post "Future Tech: 3D Metal Printing of Gun Parts and 1911 Pistol"
Scientists at the Oak Ridge National Laboratory (ORNL) have developed a system that uses lasers and fiber optics to measure very small changes (deflections) in a rifle barrel. These deflections are recorded with laser sensors, and then algorithms are used to compute the resultant changes in bullet trajectory. Using computer-calculated trajectories, the digital sighting system’s “virtual” reticle automatically adjusts to compensate for barrel deflection, as well as changing environmental conditions. The microprocessor-controlled digital reticle can adjust to 1/1000th of a Minute of Angle (MOA). That makes it far more precise than any conventional riflescope reticle. 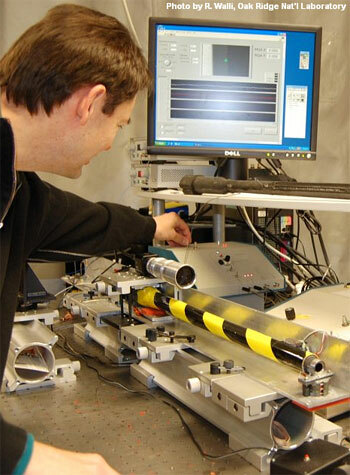 Shown below is a laboratory prototype of Oak Ridge National Laboratory’s Reticle Compensating Rifle Barrel Reference Sensor. 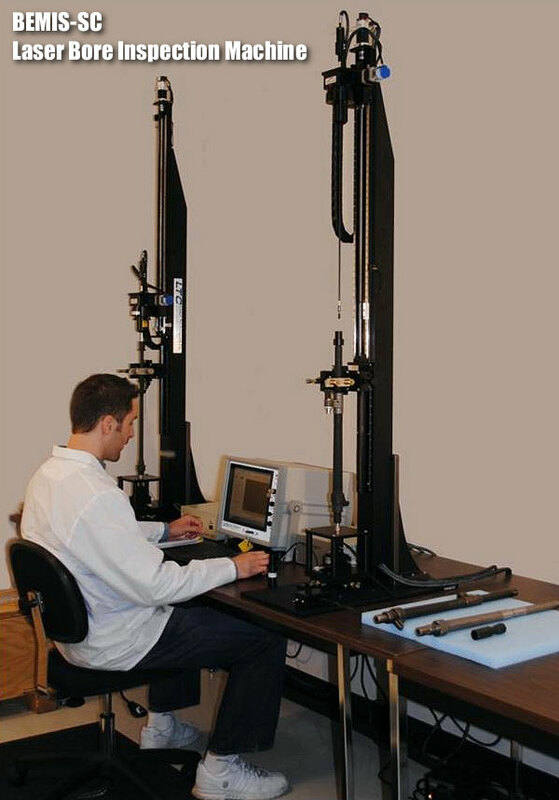 This system precisely measures the deflection of the barrel relative to the sight and then electronically makes the necessary corrections. The system was developed by a team led by Oak Ridge National Laboratory’s Slobodan Rajic, shown in the photo. The Reticle Compensating Rifle Barrel Reference Sensor takes the guesswork out of shooting by shifting the burden of knowing the relative position between the barrel and the weapon sight axes from the shooter to an electronic sensor. The system precisely measures the deflection of the barrel relative to the sight and then electronically realigns the moving reticle, or crosshairs, with the true position of the barrel, or bore axis. With modern high-caliber rifles boasting ranges of up to two miles, even very small barrel disruptions can cause a shooter to miss by a wide margin. That makes this technology indispensable from a marksman’s perspective, Rajic said. From a technological standpoint, the approach is straightforward. ORNL starts with fluted barrels (the flutes play a key role). With the ORNL technology, glass optical fibers are placed into the flutes. The sensor system contains a laser diode that sends a signal beam into the optical fibers parallel to the bore axis of the barrel. Through a combination of algorithms, optics and additional sensor inputs, the system can take into account distance and other factors affecting the bullet trajectory. Ultimately, the whole optical/laser/digital system provides the shooter with crosshairs that automatically adjust for conditions in real time. Skeptics of electronic sighting systems have complained that the resolution of a digital rifle-sight is too crude to allow precise aiming. There simply aren’t enough pixels on a viewscreen to allow ultra-precise aiming at long-range targets, shooters have said. In fairness, the existing commercially-available digital rifle sighting systems HAVE been crude — with a lo-rez screens like you might find in a portable GPS. Well you can forget all that. ORCL has achieved a break-through in digital sighting. The bar has been raised — by an order of magnitude. The resolution of ORNL’s digital, sensor-informed Compensating Reticle is 125 times better than that of traditional target reticles, which can normally be adjusted by one-eighth Minute of Angle (MOA) (at best). Now get this — the ORNL sensor can sense angular displacement and shift the reticle by 1/1,000th of a minute of angle. While this system is expensive, and designed (at this point) for the military, this technology could eventually benefit sport shooters. A decade from now, we would not be surprised if long-range civilian shooters commonly use electronically-enhanced optics, with digital reticles that automatically compensate for bullet drop (and maybe even windage). ORNL scientists are also working on technology that could yield much more precise and accurate plots of bullet trajectories. 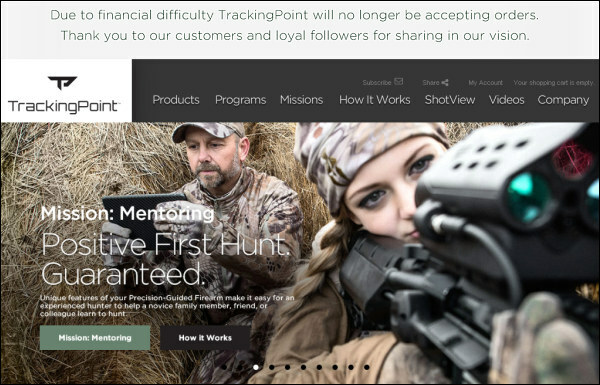 We will no longer have to rely on “guesstimated” data inputs, and certain assumptions about bullet drag factors. Rajic and colleagues are developing a laser-based, bullet tracking system that would record plot the bullet’s actual flight path while the bullet is in the air. In other words, this tracking system would be able to plot the bullet’s true trajectory from muzzle to target. That is much differerent than current ballistic “solvers” which merely draw a predicted arc based on muzzle velocity, wind and temp inputs, and a reference BC value. Oak Ridge National Laboratory is a multi-program science and technology laboratory managed for the U.S. Department of Energy by UT-Battelle, LLC. Over 3000 scientists and engineers at ORNL conduct basic and applied research and development to create scientific knowledge and new technology in key areas of science, energy, the environment, and national security. Share the post "ORNL Builds Reticle-Compensating Sight with Laser Barrel Sensor"
Crimson Trace (CTC) is extending its popular FREE Batteries for Life promotion. 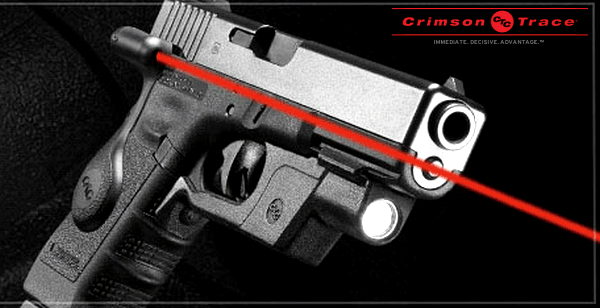 CTC customers will receive free replacement batteries for the lifetime of their laser sights, in exchange for registering their Crimson Trace products with the company’s customer service department. 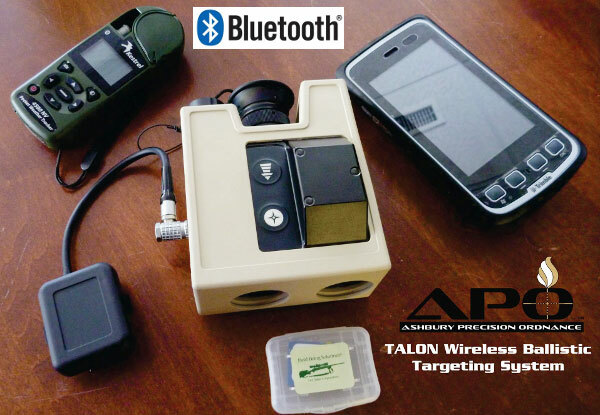 Share the post "Crimson Trace Offers Free Batteries for Life on Laser Sights"
Eurooptics.com now carries the impressive Vectronix Terrapin Laser Rangefinder. The $1995.00 Terrapin is a high-grade, milspec device rated to 2400m, well beyond the stated ranges for LRFs in the $600-$1000 class. Field reports indicated that the Terrapin is very good. One field tester, using a Terrapin set on a tripod, said the Terrapin hit 16″ plates at 800 yards more reliably than a Swarovski Laserguide. 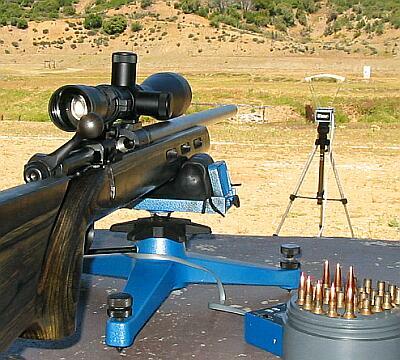 Ranging a small object like that at 800 yards is a tough test for any LRF. The Terrapin performs well on smaller objects because it has extremely tight beam divergence (this means the beam doesn’t spread out like a wide cone at long range). 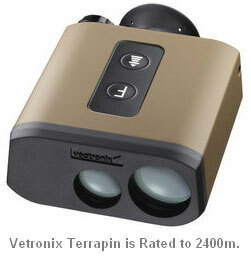 The reports we’ve received indicate that the Vectronix lives up to expectations created by its 2400m distance rating. Jason Baney reports: “This Vectronics is impressive. In the right conditions, these units can range well beyond 2000 yards. On a Snipers’ Hide Thread, Vectronix Terrapin owners have reported ranging successfully past 3000 yards on large objects.” Available in tan or green, the Terrapin has a rugged aluminum inner housing and is rated to be waterproof with 60 minutes of immersion. It is easy to hold, and weighs just 1.1 pounds. Efficient electronics allow the Terrapin to make over 7,000 ranging “shots” before the two CR123 batteries need to be replaced. 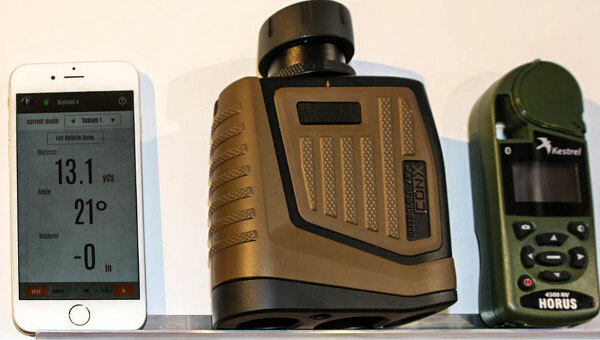 Share the post "New High-End Extreme-Range Laser RangeFinder from Vectronix"
Here’s a very good deal if you’re looking for a premium Laser Rangefinder with excellent long-range performance and a compact form factor. 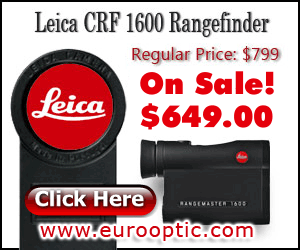 The popular Leica CRF 1600 laser rangefinder is now on sale at EuroOptic.com for just $649.00. That represents a $150.00 savings over the previous price. 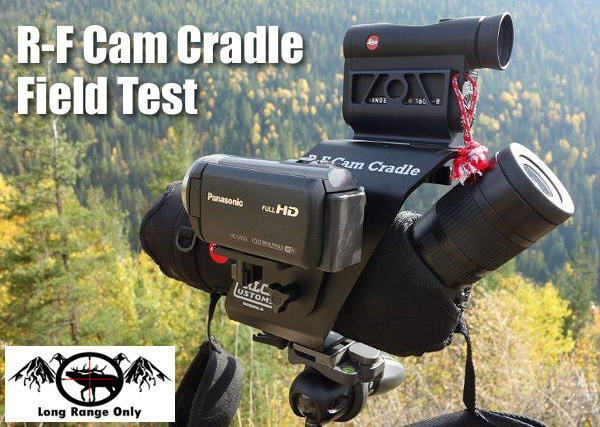 The hundred and fifty bucks you save can pay for other gear items you need. Why is the CRF 1600 on sale? 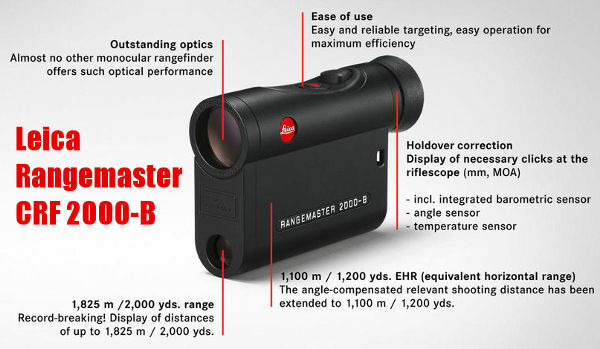 Leica is bringing out a CRF 1600-B in June, 2012. The newer ‘1600-B’ model will have more bells and whistles, yet it will be sold at the $799.00 price. That means the price has been slashed on the current CRF 1600. Should you wait for the ‘1600-B’ version? That depends. The new CRF 1600-B model offers built-in angle correction plus an LED output for holdovers (in inches or cm). It can also display the elevation clicks you need at particular distances, based on reference to a set of internal ballistics curves. 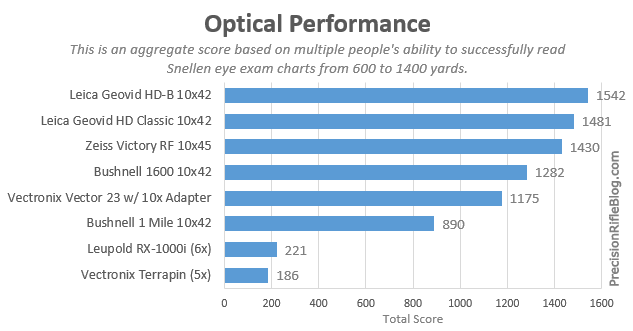 That sounds cool, but if you already have a come-up table (as you probably do), all you really need is an accurate range to the target — and the CRF 1600 can definitely deliver that. The current CRF 1600 does offer hold-over values (in cm or inches), based on built-in ballistics curves, but it doesn’t have an inclinometer and it doesn’t provide click-value read-outs. If you don’t need the “fancy extras”, or you don’t want to wait until June for the ‘1600-B’ model, it makes sense to pick up a CRF 1600 now at the $649.00 sale price. 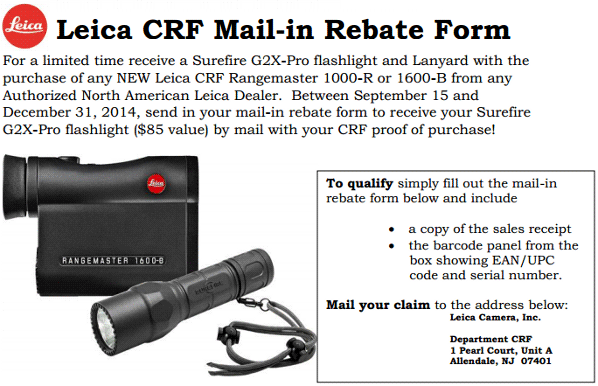 Share the post "Get Leica CRF 1600 Rangefinder on Sale for $649.00"